With a view to providing confirmed accommodation to waitlisted passengers and also to ensure optimal utilisation of available accommodation, a scheme known as “Alternate Train Accommodation” (ATAS) known as “VIKALP” was introduced as a pilot project in November, 2015. This scheme has been expanded to cover all type of train on all sectors from 01.04.2017. 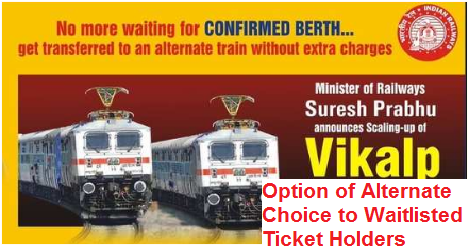 To avail this facility the passenger has to give an option at the time of booking of ticket. Passengers with waiting list status at the time of preparation of reservation charts are shifted to opted alternate trains, subject to availability of vacant accommodation. With a view to assessing the demand pattern, waiting list of trains is monitored on regular basis and to cater to additional rush during peak periods, special trains are run and load of existing trains are augmented subject to operational feasibility. This scheme will supplement the existing procedure and ensure passenger satisfaction. The overall utilisation (end to end) of reserved accommodation on Indian Railways during the financial year 2016-17 was more than 100%.